From 10:00 until 16:00 we will extensively go through my watercolor methodology. Naturally a part of this will consist of theory, but I will also do at least 2 demos to show the results in practice. In principal a watercolor painting should be finished in an hour and if it is a wet in wet painting even 20 minutes. Of course you yourself will also paint. I accept a maximum of three attendees per workshop so I can give a lot of personal attention, this has proven to be the most effective. If there are questions or special requests I will try to answer those. Bring you own materials: quality paper (I prefer, Arches 300g, rough), paints and brushes. Prices per person are €75, including a catered lunch here. Cash payment. The workshops will be organised when there are at max. 3 attendees, so dates are in deliberation! Periodically I teach courses, on a weekly basis from 09:30 until 12:00, or 13:30 until 17:00. The course covers ten lessons, bring your own materials. Costs are €325. We will work in my atelier in Blaricum. 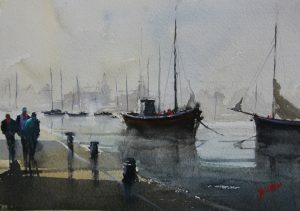 During the course we will cover, colors, tone-values, composition, brush techniques and comprehensively go over the watercolor medium in all its forms.